We’ve all experienced those times when “stuff” happens, stuff that’s outside of our control, yet its impact is significant. And when those times happen it’s easy to feel discouraged, disappointed, frightened, out of control, stuck, miserable, alone, or even resigned. During this Ask Arminda session I talk about how okay it is to feel that full range of emotions listed above (and please add the ones I’ve left off the list), but stuck is optional. Every time. Let me know your thoughts and what your personal experience has been when you consciously rise above your circumstances to create something different. Whether you’re going on an extended trip or just across the hall into the conference room for a presentation, make sure you’ve packed exactly what you need. Absolutely never ever leave home without this. You might have a different theme song for each day of the week, or for different experiences (making sales calls get one song, while presenting to your team has another). Stop whatever you’re doing right now and tell me your theme song! No one needs to see you. You don’t need to see you. Move. 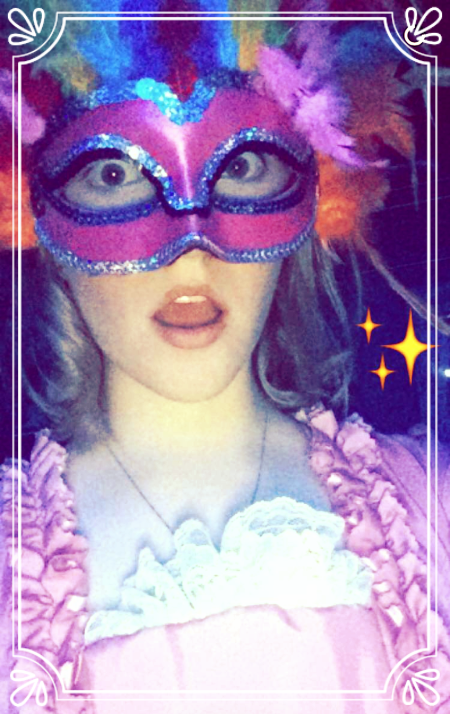 Just dance. Remember that information is neutral until you assign meaning to it. See people and situations and experiences as if you’re gathering information; don’t interpret any of it too quickly. Serve at your earliest inconvenience. Serve from your heart. Serve without expectation of return. Serve because you love, not because you want. 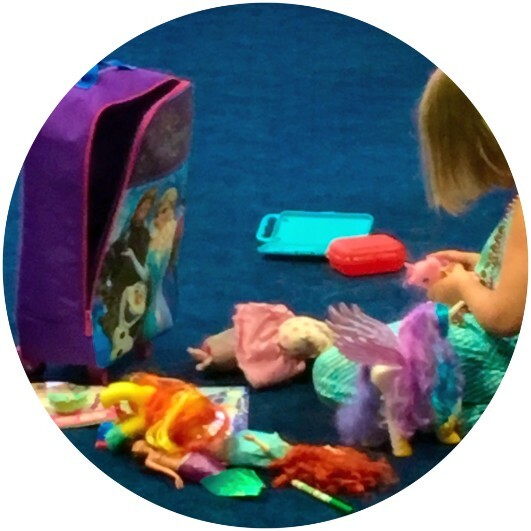 Your daughter asks you to play with her just as you’re on your way to a serious (see #2) business meeting? Drop and give her ten minutes. It lights the whole sky! What if you don’t know all the answers? HOORAY! What if the solution that worked last week no longer makes sense? HOORAY! What if you’ve been tasked with a seemingly-overwhelming project for which you feel completely unprepared? HOORAY! What if none of your hand-outs were printed and you don’t know it until five minutes before your presentation begins? HOORAY! Given your situation, what would you like to create? Robert Holden is my go-to guy on all things love-of-self-related. If you’ve not yet read his book Loveability, I recommend it immediately. Love isn’t on your packing list as optional; it’s the one thing to be sure you grab if you run out of time and nothing else gets into your bag. Love is the essential. Let me know if you’re unsure where it’s located or why it’s so important. Recently I sat through multiple performances of Cinderella the Musical and heard lines single-timers might have missed. That tendency to wait for everything around me to be ideal is something I’ve experienced in real life. What about you? “Don’t wait until you know who you are to get started. . . . It’s in the act of making things and doing our work we figure out who we are” (Steal Like An Artist, 27). And that gnawing fear you don’t know how to do what you think you might want to do, or don’t know even what it is you might want? Be about the business of living your life and not waiting for something outside of you to get it started. You do you. Whatever that looks like. However that shows up. Reinvent yourself daily. Live. Nothing is serious and boring unless and until we choose to make it serious. Everyone around you notices how serious you are and they don’t prefer it. 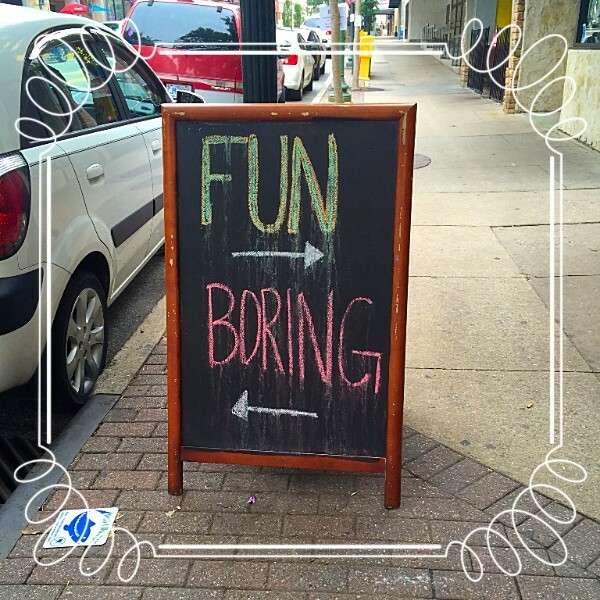 Insert fun back into your experiences. Yes, even (and especially) your work experiences. She lives in my herb garden. Directly behind Charlotte to your left is my mint and to your right, the rosemary. Charlotte cares nothing for my herbs. She’s much more interested in the garden fence between which she constructed her large web. 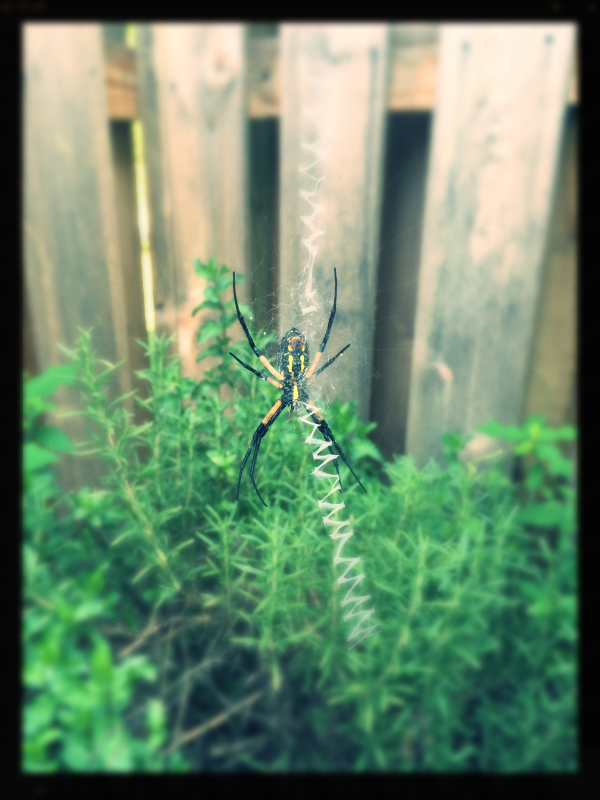 A common yellow garden spider (Argiope aurantia), Charlotte is completely harmless to humans and unrelenting in her efforts to live fully each day. I check in on her every morning. I have a chat with her, acknowledge her latest catches, express astonishment at her ingenuity, speed and cleaning of her dinner plate. Notice that fancy vertical zig zag running through the center of Charlotte’s web? Every single night before she sleeps, Charlotte eats that center zig zag portion of her web and weaves a new zig zag center, strong and reinforced, ready for her next day’s unknown adventures. Charlotte believes in the power of reinvention. She isn’t wasting any of her precious time missing yesterday’s web. She chooses daily to come from an even stronger core. She is ferocious in protecting her center and is relentless in her efforts to make it better. The center of Charlotte’s web is her epicenter for growth. She’s not messing around. She’s living out loud. Need me to weave the metaphor for you into the web? My friend Marielle introduced me to an experience I’ll never forget. Together we boarded a repurposed school bus in a small country town late one Saturday night. No money was asked of our participation; this would be a free ride. The bus was completely packed with people AND there was a caravan of vehicles following behind because there wasn’t enough space for everyone who wanted a seat. What transpired over the next two hours I could never have anticipated and I’m not sure I can — or want to try to — explain to you what happened. Perhaps what I experienced is irrelevant. And yet I never would have had the experience if I hadn’t gotten on the bus. Oversimplification? No. We don’t have to know where the bus is heading to take the ride. We don’t even have to know who else is on the bus. My experience on the bus wasn’t identical (or probably even similar) to Marielle’s or to anyone else’s riding the bus. It was only my experience being created. The adventure is made in the taking of it. We can’t have an adventure we’re not willing to take. You can’t create an adventure if you’re not along for the ride. Be in action in your life. 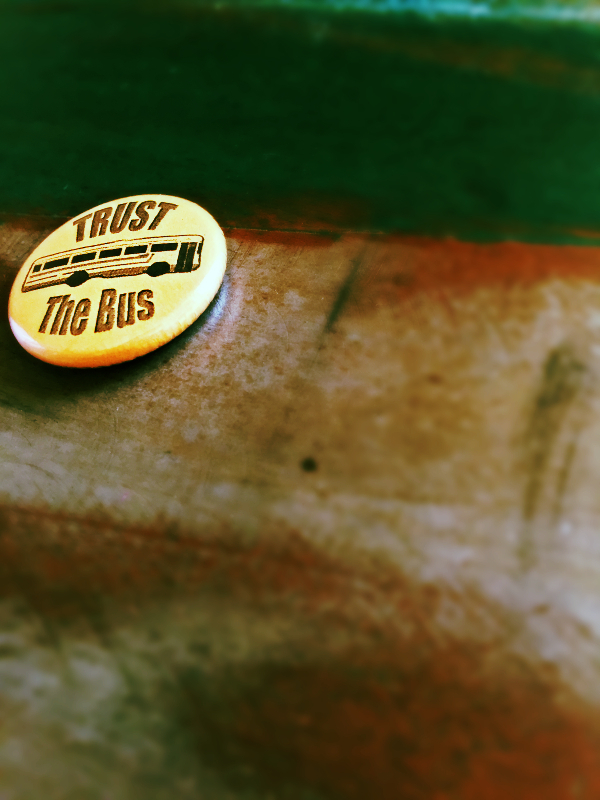 Trust the bus and test the experience. p.s. — if you had a previous ride that didn’t create the experience you thought it would, don’t allow that non-existent past be the reason you never get on another bus to test a new adventure. Take time today to notice your face. Be consciously aware of what you’re emoting to yourself and to those around you. Make your world a better place. What if My Future Wasn’t That Great? Walking through an old neighborhood recently I paused opposite the house where my college boyfriend lived. 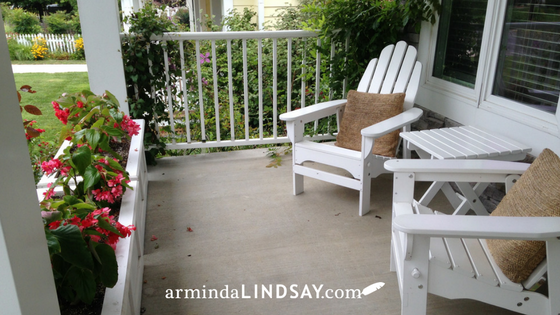 Staring at that southern front porch I smiled at the countless hours we spent sitting there, him playing his guitar while we laughed and dreamed up our futures. That version of my future never happened. And I’m so grateful it didn’t. Don’t misunderstand me; I’ve had my (countless) episodes of frustration, anger, resentment, fear, and general not knowing when it comes to the way certain events have unfolded in my life. I’ve certainly been on the side of believing something different was somehow supposed to happen when things didn’t go the way I imagined and/or planned for them to go. Until I didn’t feel that way. What if I’m exactly where I’m supposed to be because it’s right where I am? What if what I envisioned for my ideal future wouldn’t have been so ideal? What if I’m happier now than I ever could have possibly imagined at a different time in my life? And what if instead of being a victim when life turns things upside down I turn them around and own all of it, and ask myself how I can be empowered by the not knowing? That’s a future I can smile about. While the New York City bakery in front of which sat this brilliant billboard was promoting more cookie sales (an initiative I fully endorse), it was the message above the hashtag that struck me. When we set resolutions, whether at the beginning of a calendar year or at the beginning of a new day, how often do we resolve to simply be happy? What might that look like for you? Often we think of happiness as an external something to be obtained, rather than a choice we make on the inside. Are the goals, initiatives, objectives and resolutions you set for yourself serving you and your personal growth? 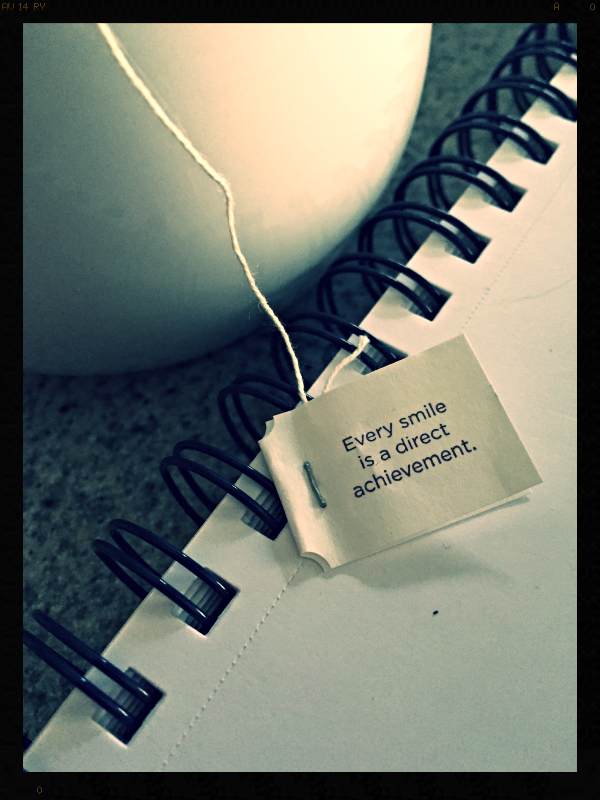 Or are they overwhelming, discouraging, demotivating, and frustrating your progression? For me, resolving to let myself be happy means asking myself whether my goals are truly serving me. If the answer is anything but a resounding YES, then I course correct and set a new resolution. No decision is ever final and I’m allowed to renegotiate with myself. 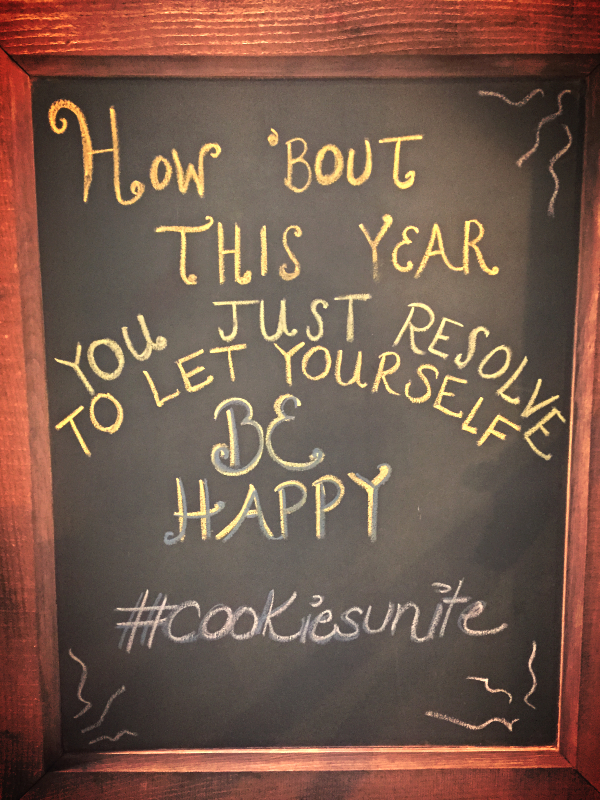 What does a happiness resolution look like for you? Listen to your internal indicators and notice any red flags that might be trying to get your attention. Is it time to renegotiate with yourself? Make it simple: choose happy. I love to run. No, not the I have to run a marathon to feel like I’m a runner kind of run. (And my hat is off to those who are that kind of a runner; I just don’t happen to include myself in your number.) I just like what happens to me mentally when I run, so when I don’t (or can’t) run for a while, I really miss the brainy benefits, plus I feel loads better physically, too :). I haven’t been running in a while. A very long while. It’s been 18+ months of inexplicable and frustrating hip pain and intensive work with both my physical therapist and my rolfer and I’m easing back into an exercise routine that works for me. So last night stepping on that treadmill for the first time in a really long time felt a bit nostalgic and I smiled while warming up and searching my iPod for exactly the right audio program (which is always choosing between Steve Chandler and Steve Chandler: my amazing coach) to accompany what would surely be an easy run. Maybe I shouldn’t be running at all. I’m not ready for this. What if I undo all the efforts to put me back together again? Who are you, Humpty Dumpty, all of a sudden? What if walking will always be the better choice for me? I’m probably never going to be the same again, so why bother? It’s just been a while. You’ll get used to it again. Keep running. You love this! Pay attention to Steve, not your burning legs. And then it happened: nothing was screaming or burning or dying or demanding a full stop. Quite the opposite: I wanted more. Energy surged through my entire body, pulling me forward, wanting more. And I leaned into my run, ready now to go the distance. I’m no expert on physical fitness training, but I’m pretty sure that what happened to me at mile 1.64 is not uncommon. So not uncommon, in fact, that we ALL experience this same phenomenon in our lives, whether on or off the running track. Whenever I start something new it’s hard because I don’t understand how to do it. I don’t know what comes next. My learning curve is steep and if I look around me at other people doing what I want to do I’m discouraged because they’re so much better than me and it’s an oppressive weight thinking about everything I need to learn before I will be capable of running a marathon. And if I’m not careful, I quit long before I reach mile marker 1.64. When I counter the negative story I’m playing on repeat with a new story — equally made up as the negative one — and tell myself I’m fine, stay the course, remember to breathe, and keep showing up (be consistent in my efforts), I arrive at mile marker 1.64 delighted with the surge of energy that infuses my entire being. I run into my ready. I don’t start with it. Starting is the hard part. We’re never ready for anything. How could we be? Don’t be fooled by your made up story about motivation, either! Readiness takes time, so just start your project, open the business, share your idea, write the story, create the blueprint, design the website, register the LLC, commit yourself!!! And before you realize it, you’ll be ready to go your distance around mile marker 1.64. What is it you want to accomplish, or create, or achieve, or learn, or share? Grab a bottle of coconut water and lace up your runners. You’ll be ready to go after you get started. I promise.